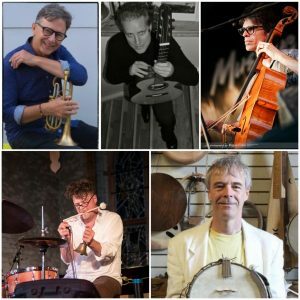 The Silence Collective is composed of Guelph-based improvisors dedicated to intentional listening and inventive sounding. The group has collaborated with artists ranging from Thomas King (author of An Inconvenient Indian) to Dong-Won Kim (member of Yo Yo Ma’s Silk Road Ensemble). This outing during the Guelph Jazz Festival is entitled Tabula Rasa which means “an absence of preconceived ideas or predetermined goals; a clean slate.” The players will include Matt Brubeck on cello, Gary Diggins on cornet, Daniel Fischlin on guitar, Lewis Melville on bass, and Joseph Sorbara on percussion. Each member layers in additional colours from both acoustic and electronic palettes. Surprise guest artists will be included in the evening’s performance.